Located on the banks of river Betwa is the historical town of Orchha, which was established in the 16th century by a Bundela Rajput chief named Rudra Pratap. One can find that the river Betwa divides itself into seven channels, which are known as Satdhara. According to legends each channel represents one of the seven erstwhile chiefs of Orchha. A visit to the ancient town would give you the feeling of being transported to a whole different era. Many of its monuments, which have stood the test of time, stand proudly showcasing the grandeur of a bygone era. 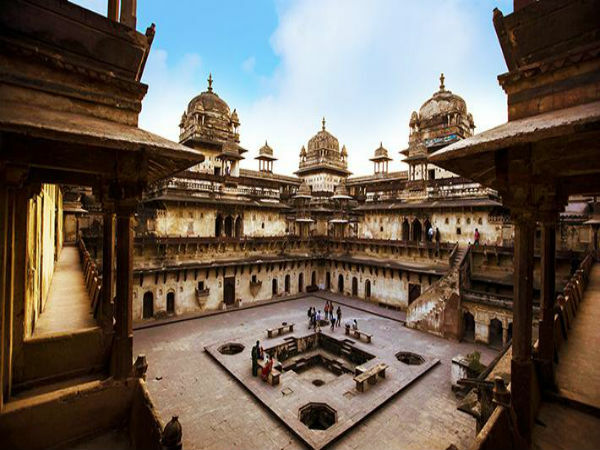 At Orchha, one would come across a large number interesting temples and palaces which would help one realise the fantasy of travelling back in time. The historical town of Orchha is a year-round destination which can be visited any time during the year. However, the months from September to February are some of the best months to visit the place as the weather remains pleasant. By Air: The nearest major airport to Orchha is the Gwalior Airport which is located at a distance of 113 km from here. The airport receives regular flights from major airports across the country, such as Delhi, Mumbai, Bengaluru, etc. By Train: The nearest major railway station is at Jhansi which is located at a distance of 16 km from here. The station receives a number of trains which connect to various other stations across the state of Madhya Pradesh. By Road: One of the best ways to reach the place is by road, as it offers excellent connectivity via road transportation. There are plenty of buses which connect Orchha to most of the major towns and cities across the state and to a number of cities across the country. The total driving distance from Delhi to Orchha is about 498 km which would take you about 8 to 9 h to cover. There are two major routes by which one can reach the Orchha from Delhi which are as follows. If you opt for route 1 to reach the destination from Delhi, it would take you about 8.45 h to cover a distance of 498 km via the Taj Express Highway and NH 44. The route takes you through some of the well-known towns of Agra, Gwalior, Jhansi, etc. If you opt for route 2 to reach the Orchha from Delhi, it would take you about 10 h to cover a distance of 505 km via the NH 44. The route passes through the holy town of Mathura and through the historic towns of Aurangabad, Gwalior and Jhansi. Home to the Taj Mahal, Agra, which is located at distance of about 216 km from Delhi, is the abode of three UNESCO World Heritage Sites-the Agra fort, Fatehpur Sikri and the Taj. The city's formation dates back to the 11th century and has strong roots in history; it was a place which was ruled by both Hindu and Muslim rulers and their influences can be clearly seen in the culture of the heritage city. The major attractions here without second thoughts are the various monuments. Apart from the Taj Mahal, one can visit the Agra Fort, the tomb of Akbar and a number of Mughal monuments, which are located on the banks of river Yamuna, such as Chini Ka Rauza, Dayalbagh, Diwan-i-Khas, Jama Masjid, Mehtab Bagh, etc. Located on the banks of the Betwa river, the old-world charm of Orchha tends to cast a magical spell on its visitors who come from across the globe. The medieval architecture of the palaces and temples speak volumes about the city's rich cultural heritage. It was the capital city of one of the most powerful empires who ruled in the country and built magnificent and grand havelis and temples, which leave every individual awestruck. Orchha is filled with the air of an unmistakable mystery with its abstract architecture, which surprisingly converts forts into temples. It is the only place in the country where Rama is worshipped as a king and is also the place where a royal member is considered a demigod. In this town the temples resemble tall citadels, where daily rituals run like a clockwork, not unlike the Changing of the Guard. Also known as Orchha Temple, the shrine dedicates itself to Rama and is the only temple in the country where he is worshipped as a king in an actual palace. According to legends, the Queen of Orchha happened to be an ardent devotee of Rama. Once she decided to make a pilgrimage to Ayodhya and offers prayers there. While leaving from there, she wanted Rama to come along with her as a boy to Orchha. Pleased by her devotion, he agrees to accompany her on one condition; he should be moved from one temple to another and then he would remain at the place she took him to first, which coincidently happened to be the palace. Ever since then he has remained there. It is also the only temple where the deity is offered a gun salute by police officials who are specially appointed for this daily ritual. One of the fine examples to depict the grand Mughal architecture, the structure was built in honour of the Mughal emperor Jahangir; it was built in the 17th century by Bir Singh Deo. The structure features a series of steep staircases and vertical walkways along with eight-domed towers and pavilions, which attract visitors in large numbers who return back with a magical charm within themselves. These structures are the tombs of the Bundela kings and are located on the banks of the river. Constructed in true Bundelkhand style of architecture, these structures date back to the 17th and 18th centuries, which were considered the golden era of the Bundela kingdom. Constructed on elevated platforms and supported by pillars, these structures captivate every visitor's attention especially during dusk when the setting sun creates a reflection of these structures on the Betwa river.